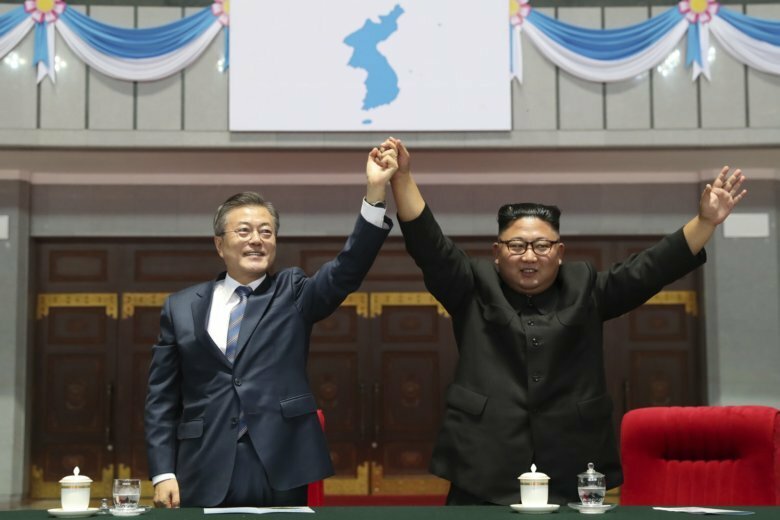 WASHINGTON (AP) — A better-than-expected outcome of the summit between the two Koreas immediately kick-started stalled negotiations between Washington and Pyongyang, boosting President Donald Trump’s high-stakes push to get the North to give up its nuclear weapons by the end of his first term in office. But it left open a burning question: Will the concessions North Korean leader Kim Jong Un is offering be enough to persuade the U.S. to meet any of his demands? Trump, characteristically, hailed the result of the talks in Pyongyang between Kim and South Korean President Moon Jae-in as “very exciting” and a sign of “tremendous progress” in his effort to get North Korea to denuclearize, which Kim agreed to do in vague terms when he met with Trump himself in Singapore in June. “This will mark the beginning of negotiations to transform U.S.-DPRK relations through the process of rapid denuclearization of North Korea, to be completed by January 2021, as committed by Chairman Kim, and to construct a lasting and stable peace regime on the Korean Peninsula,” Pompeo said in a statement, using the initials of the country’s official name, the Democratic People’s Republic of Korea. With scant progress in the past three months, Trump has been open to criticism that he had been too eager to hold an unprecedented meeting with the North Korean leader in the summer and gained little in return. Moon, who was the handmaiden of the Kim-Trump dialogue back in the spring, was under considerable pressure this week to extract concessions from Kim that could sustain the rapprochement between Washington and Pyongyang. While Kim didn’t commit Wednesday to giving up his arsenal of nuclear weapons and ballistic missiles that pose a threat to the U.S. mainland, he did promise to dismantle North Korea’s main rocket launch site in the presence of international experts, and offered to shutter its Nyongbyon nuclear site. That’s where the North has a plutonium reactor and a uranium enrichment facility that can produce fissile material for atomic bombs. Dismantling it wouldn’t reduce North Korea’s atomic stockpile, thought to be enough for between 40 and 60 bombs, but it could help cap it. The catch is that Kim wants the U.S. to take unspecified “corresponding steps” — a likely reference to North Korea’s desire for the U.S. to declare a formal end to the Korean War, in which fighting ended in 1953 without a peace treaty. The North is also vying for the U.S. to allow relief from sanctions that are hurting its struggling economy. Washington will be reluctant to grant hasty concessions given North Korea’s poor record during a quarter-century of on-off nuclear negotiations in following through on its promises. Mindful of past failures, the Trump administration has been demanding denuclearization, or at least concrete progress toward that goal, before it grants rewards. Trump himself, who is eager for results in his signature foreign policy, sounded open to considering reciprocal steps, telling reporters Wednesday: “We’ll see what he’s looking at.” Trump also declared, “we’re making tremendous progress” with North Korea, citing its halt in nuclear and missile testing since last November. Kim agreed to allow outside experts to observe the dismantling of its Sohae launch site, where it has tested missile engines and blasted rockets into space. Pompeo welcomed that as a step agreed to by Trump and Kim in Singapore, and said it would be done in the presence of U.S. and international inspectors. North Korea has long been reticent of such outside scrutiny. It expelled U.N. inspectors from its Nyongbyon nuclear site a decade ago when international aid-for-disarmament talks collapsed and hasn’t allowed them back in since. The U.S. is demanding their return to see all facilities at Nyongbyon dismantled. Jenny Town, research analyst on North Korea at the Stimson Center think tank in Washington, said shutting Sohae, a site with a huge launch tower and other facilities in which North Korea has invested heavily in recent years, would be a major concession from Kim. The North’s satellite launches are regarded with deep suspicion by the U.S. and are prohibited under U.N. Security Council resolutions because the same technology might be used for missiles. “The North Koreans have always held out launches as their right as a sovereign nation. They’ve never been willing to negotiate on that particular point. So they have eliminated an obstacle that has derailed negotiations in the past,” Town said. Still, the dismantling of the site in the country’s northeast would have limited impact on North Korea’s ability to pose a nuclear threat to the United States. The North has developed mobile missiles launched from vehicles, meaning it doesn’t need a designated launch site to fire a nuclear-tipped missile at America. And progress on freezing operations at Nyongbyon — which is probably not North Korea’s only nuclear production site — remains contingent on the U.S. making concessions of its own, steps that could be politically unpalatable for many in Washington, including among hawks in Trump’s own administration and in Congress. Agreeing to a declaration on ending the Korean War before North Korea has reduced its offensive threat — including the thousands of artillery guns it has trained on U.S. ally South Korea — is opposed by many who fear that the North is maneuvering to win a withdrawal of the nearly 30,000 U.S. forces in the South. There will also be resistance to rolling back sanctions adopted by the U.S. unilaterally and through the U.N. without significant progress toward denuclearization and a clearer idea of exactly what North Korea has in its nuclear arsenal and where all its facilities are located. David Maxwell, a retired Army colonel who served in South Korea and is now a fellow at the Foundation for Defense of Democracies in Washington, cautioned that Kim’s objective is to weaken the U.S.-South Korea alliance and capitalize on Trump’s desire to reduce the military burden on America overseas. “This appears to be setting the conditions for the president to be able to say the threat to the U.S. homeland has been sufficiently reduced or eliminated. This could very well set the conditions for the president to withdraw U.S. forces (from South Korea) as he has stated is his desire,” Maxwell said.